Computer Cable Store™ Inline Attenuator Pad - F-Type RF - 16 dB. 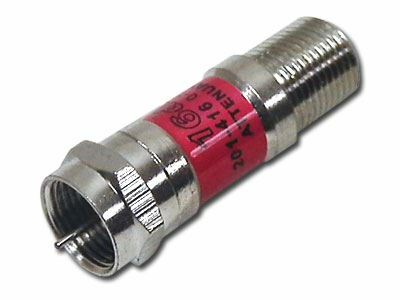 0-1750MHz Female-to-Male Attenuators. Monolithic Ceramic Printed-Board Circuitry, Nickel Plated Machined Brass Construction, 22-Gauge Spring-Steel Center - Tolerance 5%, Return Loss 20dB typical - DC Power Blocking.